At Target, decisions such as the floor plan and where to stock what are increasingly made with the help of experts in India’s technology capital. Data scientists here scan shop sales data to find patterns on customer spending and look for ways to nudge them to spend more. The team in Bengaluru also engages with the shoppers on smartphones to get them buy online from Target, rather than rival Amazon. “We are talking to about 80% of the top retailers, not just in the US but in Europe as well, and almost everyone is looking at setting up captives in India. They are at different stages of the plans, but three years out, I would expect about 80% of the world’s top retailers to have a presence here,” Lalit Ahuja, CEO of consultancy ANSR, told ET. Ahuja’s firm has helped about three dozen companies set up inhouse centres in India. As many as 11 of these were in the retail sector and four in consumer products. 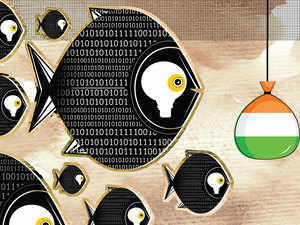 If the early players came looking for the technology talent that India offered, they now realise that the country has not just technology but a concentration retail expertise, he said. Others too have similar views. No single company is as invested in beating Amazon as Walmart. The world’s largest retailer got its India tech foothold through an acquisition, of Kosmix which it rebranded Walmart Labs. The country is now key to its tech plans. “We have four chief technology officers in Walmart and we meet every week and we’re constantly talking about growth plans and how many seats in Bangalore we get. Bangalore is the one place we all are. It’s serving as the seed for the new models,” Jeremy King, executive vice president and chief technology officer at Walmart, told ET. King said Walmart had begun piloting robots in stores to help clean spills and spot empty gaps on shelves. In addition to its $19 billion acquisition of ecommerce company Flipkart and boosting talent at Walmart Labs, the Bentonville, Arkansas-based company is scouting for startups it can take over for the talent they have. ET reported that the company made its second acqui-hire, Int.AI, in India last month, as part of its plan to buy about five startups a year in the country. It even has a unit of what it calls the CIA — competitive intelligence analytics — in India to help win the global ecommerce race. Even for those companies that have come to Bengaluru initially to handle customer calls and process employee payrolls, their operations here have advanced to handle more critical business roles. The scale at which retail companies are growing is leading to a massive hunt for talent with senior leadership coming from homegrown ecommerce players. Walmart’s India Lab is headed by Hari Vasudev, who was previously a senior vice- president of engineering at Flipkart. Online commerce and Internet company Rakuten’s India unit is also headed by a former Flipkart executive, Sunil Gopinath. “We have been able to grow Rakuten as a technology brand in India. If you look at the kind of talent we are getting, we are hiring people from Amazon, eBay, Flipkart, from fin-tech companies like Paytm, startups and from big software companies like Oracle. There is probably no top company in Bangalore that is not represented as a hire by Rakuten,” Gopinath told ET in a recent interview. Rakuten’s India headcount is currently about 450 and the company plans to double that in the next 12-18 months. Indian talent is also part of its operations in Japan — out of the 2,500 engineers in its home country, about 60% are non-Japanese, from India, China, the US and Korea. Smaller retailers that have established centres in India are also expanding their technology operations here. Jobs at these companies span the spectrum, though, unlike traditional IT services, there are limited requirements for freshers. Mid-level jobs are more common and senior leaders are also in demand. For some companies, the employee growth rates have been significant. Lowe’s began its India operation four years ago with 20 employees. It now has 1,600, and expects to add more. “In the coming years, we plan to hire more people to join our team in Bangalore, to enable our technology transformation initiatives and be a part of our growth story,” said James Brandt, senior vice president and managing director of Lowe’s India. Lowe’s employees work on ecommerce and digital solutions, data management and analytics, finance, infrastructure, quality and operations. Given the long distance between Bengaluru and the retailers’ locations across the globe, companies go the extra mile to keep the operations here connected to their global strategy. Minneapolis, Minnesota-based Target, one of the earliest retailers to bet on Indian talent, has a yearly strategy meeting that takes place at the start of the financial year for its Minneapolis and India leadership. Its CEO and chairman, Brian Cornell, and his executive team attend the annual India meeting. “Visits by our team members to our headquarters in Minneapolis help them get a better sense of the Target experience and our guests. Team members collaborate at every level. A matrixed approach to organisational structure is adopted where product ownership lies wherever the expertise is,” Ankur Mittal, vice president of Digital Technology for Target India, said. Target has nearly 3,000 employees in India, Mittal said.